Four handy books to build reading and comprehension skills at grades 4-8, each containing 35 reproducible passages for practice and assessments. The books include high-interest fiction and non-fiction passages, plus test–formatted practice questions (multiple choice and short answer) that target specific reading comprehension skills. Model lessons, assessments and answer keys are also included. 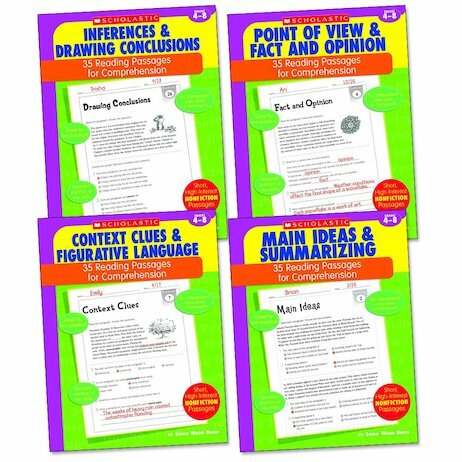 This pack contains four titles: Context Clues and Figurative Language, Inferences and Drawing Conclusions, Main Ideas and Summarizing and Point of View and Fact and Opinion.